From the popular video game Aliens: Colonial Marinescomes this stunning figure of a Xenomorph Raven. The Raven may resemble an ordinary bipedal Xenomorph, but this creature is larger and almost entirely encased in a bullet-proof, chitin carapace. Like a Queen, it only walks with its large hind legs and its tail has a distinct ridge of spines at the base of its harpoon-like blade. This fully articulated Raven action figure comes with an extendable tongue and exchangeable hands, as well as a stand to display in your collection. 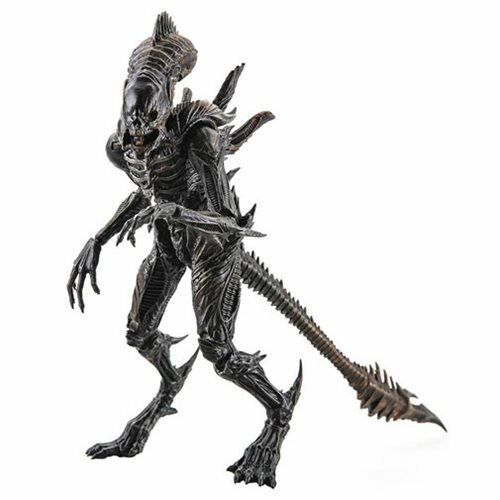 This Aliens: Colonial Marines Xenomorph Raven 1:18 Scale Action Figure - Previews Exclusive measures 5-inches tall.